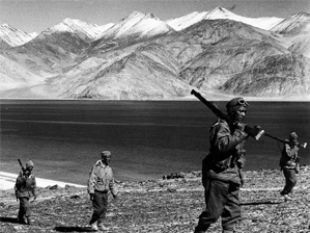 On 21st October itself, the Chinese also attacked Indian forward posts near Sirijap pass on the northeast shore of the Pangong lake. 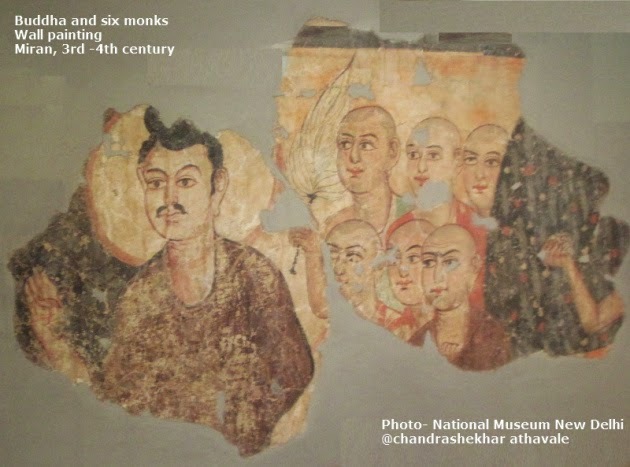 During previous years, China had moved its armour from Rudok in Tibet to Khurnak fort, which was well fortified. 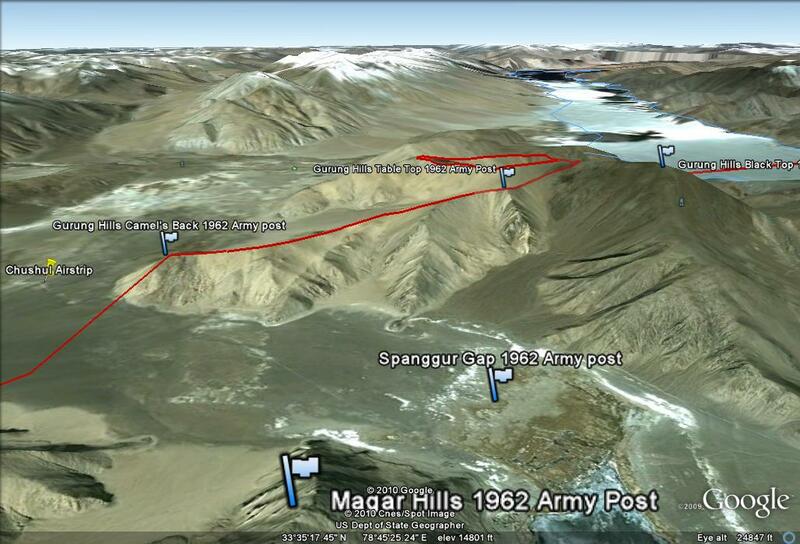 They had also built roads over the years, up to Sirijap pass area along the northeast shoreline of Pangong lake. 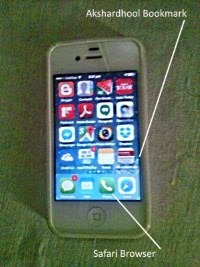 The attack started with a bombardment of posts in Sirijap La area. After continuous bombardment of about 2 or 3 hours, Chinese armour moved in along the shoreline towards Sirijap area. Unfortunately, no anti tank weapons were made available to the Indian outposts in this area. The Sirijap posts were commanded by Major Dhan Singh Thapa., who ordered his men to attack the Chinese soldiers with Khukaris ( A Nepali dagger like weapon) and bayonets. 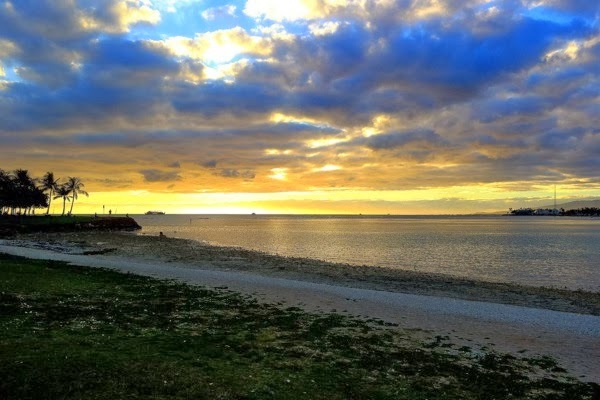 A fierce hand to hand battle raged along the shoreline, with Gurkhas killing more than 100 Chinese soldiers before perishing themselves. Major Thapa somehow survived the fierce hand to hand battle. He was awarded later India's topmost Gallentry award “Param Veer Chakra.” After fall of Sirijap posts, it was impossible to provide support to Yu La outpost. This outpost was located in the mountains between the southwest shore line of Pangong lake and the northeast shore line of Pangur lake and was supported essentially from Sirijap posts by boats ferrying men and materials across Pangong lake. Because of this reason, it was decided to call back all the soldiers manning the Yu La outpost. With this withdrawal , all the outposts to northeast of Chushul were now in Chinese hands. There was a complete lull along the border for next few days, may be because of stiff resistance shown by Indian defenders or unexpected heavy losses on Chinese side, but we may never know. On 27th October, Chinese attacked posts in Chang La and Jara La near village of Demchok located at southern end of Ladakh-Tibet border. The commander of Chang La post, Jamadar Ishe Thundup saved lives of all his men but was killed in the fighting. He was later awarded a gallantry award “Veer Chakra” posthumously. The soldiers defending Jara La, managed to escape in the cover of darkness. With fall of these posts, Chinese had captured villages of Demchok and Demchele on Indus river and had effectively blocked any possibility of a counter attack by an Indian column in Tibet. 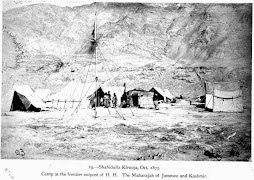 Now the garrison at Chushul and forward posts around it remained between China and capital of Ladakh; Leh. 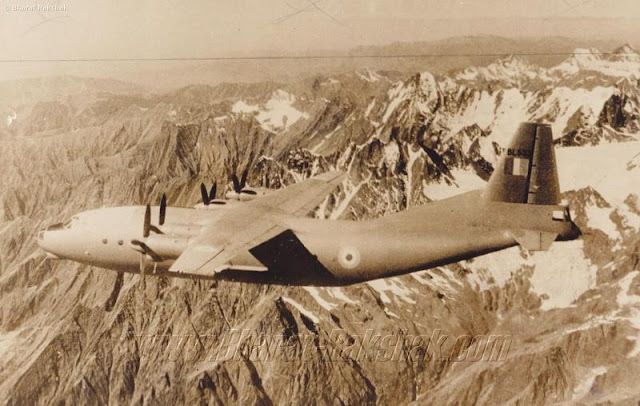 Considering the seriousness of the situation, commander of Indian forces in Ladakh, Brigadier Raina decided to airlift 25 pound Howitzers and AMX-13 light tanks to augment defense of Chushul. Within next 2/3 days, the guns and tanks reached Chushul. For Indian air force, this was a big challenge as Chushul only had a make shift airstrip with surface made from perforated steel planks or PSP. Air force's 44 squadron transported six numbers of AMX-13 light tanks in their AN 12 transport air craft. The tanks were carried in two parts, the hull and gun in one flight and the chassis in second. With arrival of these, one biggest deficiency in defense of Chushul was no doubt overcome. In addition some additional troupes also joined the garrison in Chushul. The army considered the possibility that the main supply route to Chushul through Tsaka La pass was likely to be overrun by Chinese and accordingly kept an alternate route to Chushul ready for use. Chinese began their assault on Chushul on 18th November 1962. Chinese artillery bagan very heavy bombardment of Indian outposts in Spangur gap, Rezang La pass, supply route through Tsaka La pass. Gurung Hill, Magar Hill and the airstrip itself. This bombardment proved quite ineffective. Chinese guns then advanced ahead of Chinese posts in Spangur gap and started bombardment. This brought them in sight of the field guns on Magar hill. When Indian guns opened up, few Chinese guns were destroyed in Spangur gap and the bombardment was silenced. After this Chinese artillery retreated and never again tried to bombard the Chushul aitstrip. This attack perhaps made Chinese realize that they must destroy all the Indian outposts around Chushul before making any attempt for Chushul. Indian soldiers were waiting at Rezang La post when human waves of thousands of Chinese soldiers attacked from both sides. Major Shaitan Singh and his men fought this battle to the last man and the last bullet killing more than 1000 Chinese soldiers. 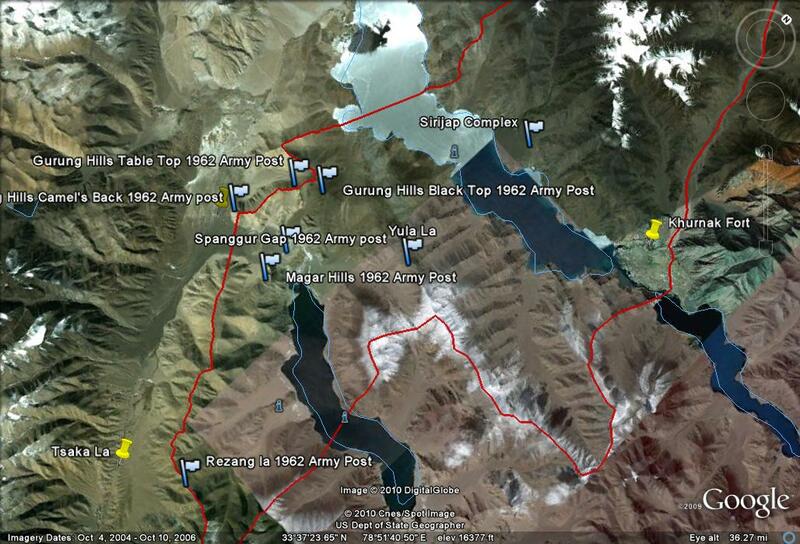 The Chinese, now shifted their attention to Rezang La pass outpost. 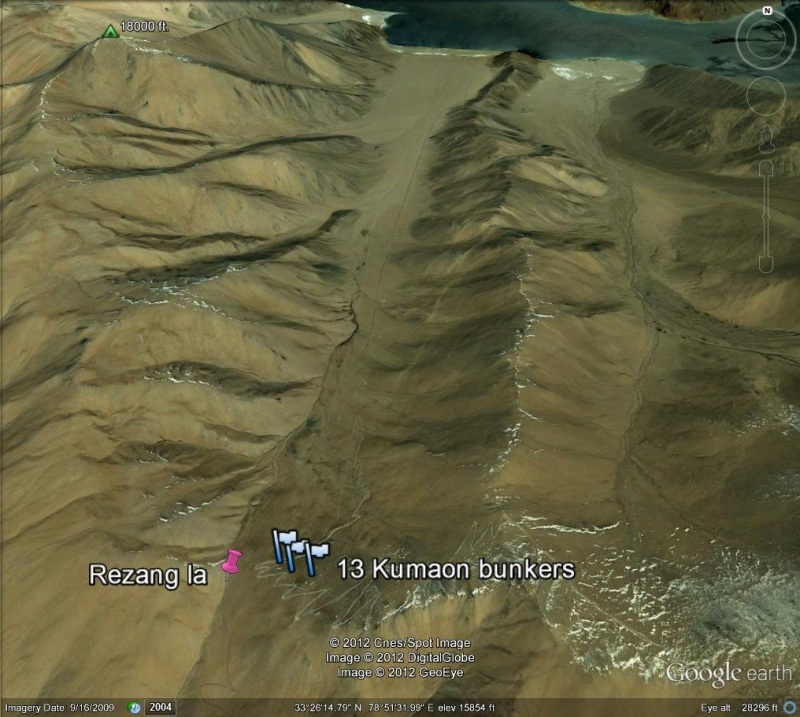 This outpost was a major Indian defense position located in the mountain on the southwest shoreline of Pangur lake. 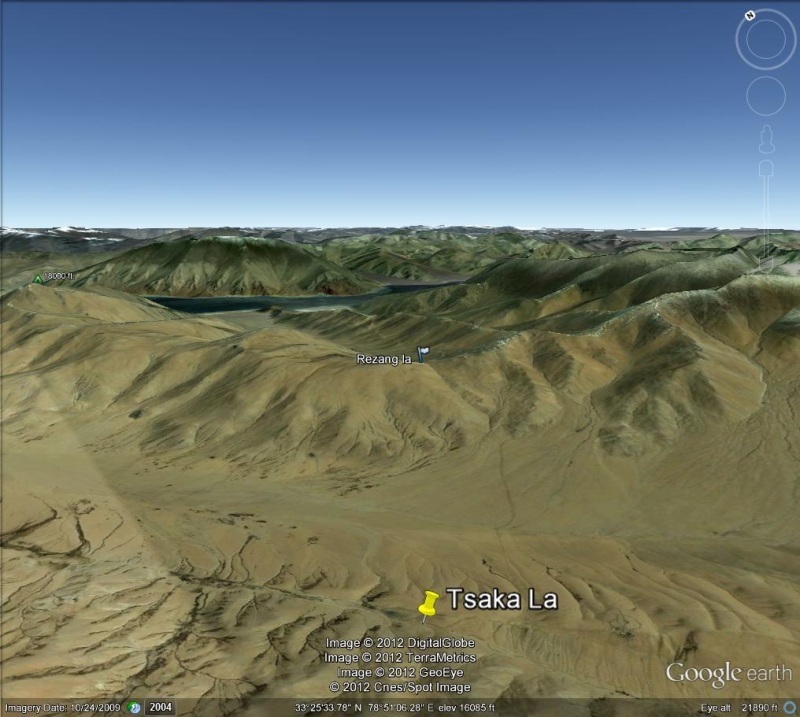 As long as Rezang la was held by Indians, no attempt was possible by China to capture the main supply route to Chushul through Tsaka la pass. Indian soldiers of the 1st company of 13th Kumaon Rifles led by Major Shaitan Singh were well dug in here with a clear view of all the area upto Pangur lake. It was well neigh impossible for Chinese to move towards Chushul as long as Rezang La was in Indian hands. The only problem for the Indians at Rezang La position was that a hill feature was coming in the way of getting any covering fire from the Indian artillery for their support. It was clear that major Shaitan Singh's men would have to fight it out on their own. Their orders were clear. Fight to the last man and the last bullet. Such was the importance of Rezang La. After heavy bombardment of the post, Chinese attacked Rezang La from two sides, Major Shaitan Singh and his men were ready for them. The battle that developed later at Rezang La, can truly be described as the mother of all battles. Chinese had sent thousands of their men just to attack one outpost. The Indians experienced the Chinese technique of human wave assault here for the first time. 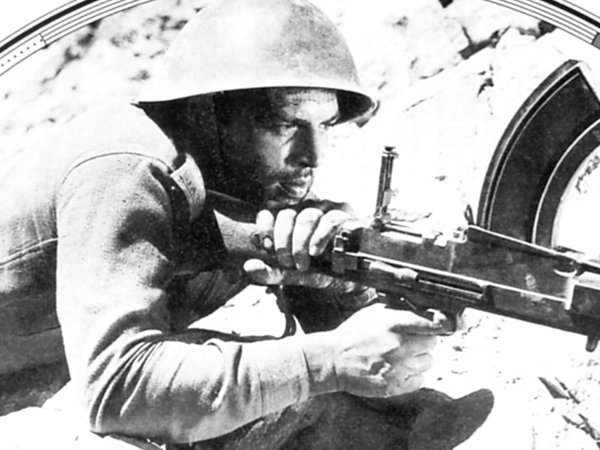 As Indian machine guns virtually mowed the waves of Chinese soldiers, more and more waves of soldiers kept coming. 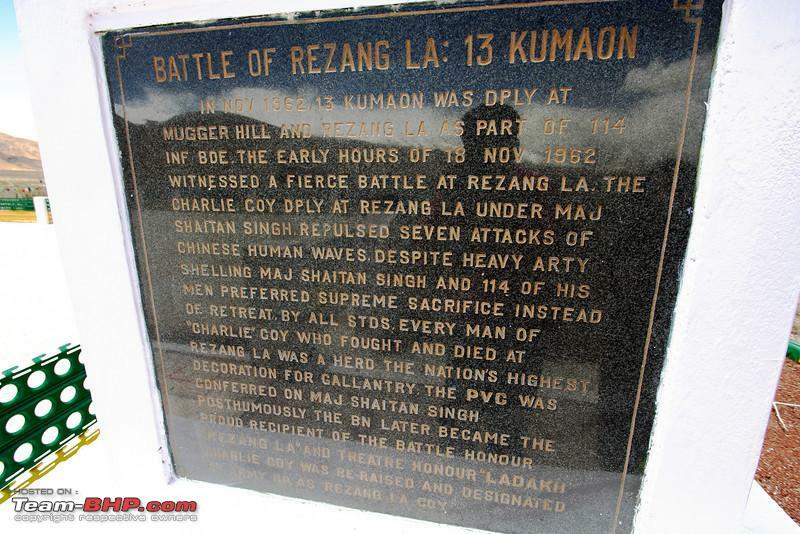 The fight that Major Shaitan Singh and his men gave at Rezang la, showing extreme valour and bravery, has very few parallels in the history of battles anywhere in the world. When this battle was over, with last Indian soldier fallen and last bullet expanded, the slopes to Rezang la were stacked with dead Chinese soldiers. Out of Major Shaitan Singh's 118 soldiers, 105 had died at their battle stations, 5 were picked up by Chinese in wounded conditions as they overran the outpost and 4 managed to escape to safety of Garrison at Chushul. Major Shaitan Singh was awarded highest gallantry award “Param Veer Chakra” and 5 others were awarded “ Veer Chakra” all posthumously. The battle was so fierce that more than 1000 Chinese soldiers had perished in this attack. After the fall of Rezang La, in a most surprising move, Chinese attackers simply went back and never occupied the post again. In the summer of 1963, a shepherd moving with his herd, accidentally reached Rezang La. He had a shock of his life, when he saw dead Indian soldiers still at battle stations with their rifles and guns in their hands. A dead medico was found with an injection syringe in his hand. All bodies were then brought down with help of International Red Cross to Indian side and last rites were performed. 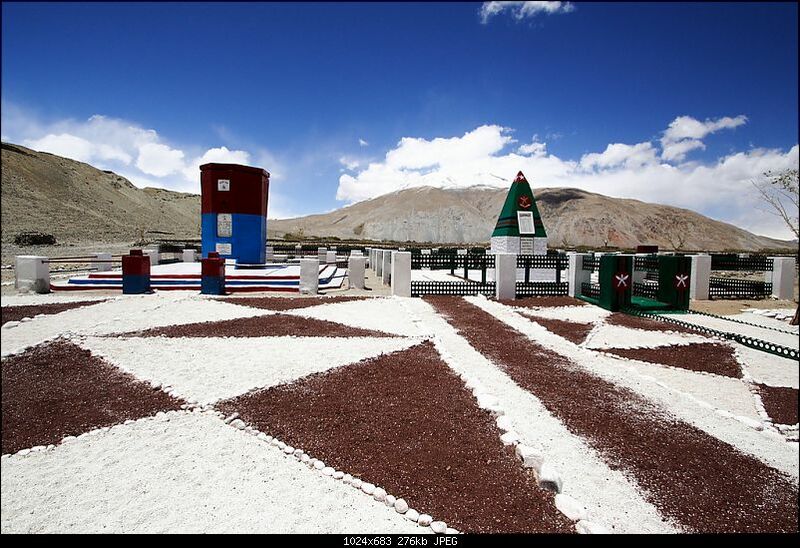 A memorial has been now erected for the brave soldiers of Rezang La. An excellent movie named Haqeeqat, was produced on the epic battle of Rezang La in 1964. 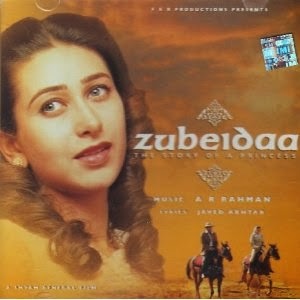 It may be worthwhile for anyone interested in this history to watch this movie. Meanhile, Chinese had launched an attack on Indian positions at Black top on Gurung hill with the same human wave technique. Fortunately, the soldiers here, could get the help of the Howitzers and AMX tanks of the Chushul garrison. The posts here repulsed two such human wave attacks before falling. Chinese had now cleared all obstacles in the way towards Chushul. The Indian losses in the battle of Chushul were 140 men as against Chinese, who had lost more than 1000 men. Chushul airstrip was still safe and usable because of the effective use of the Tanks and the field guns. Realizing that the next battle would be for Chushul, it was decided to call back all the soldiers still positioned in the forward posts to regroup and take defensive positions for Chushul and wait. However in a biggest anti-climax, within 3 days of the heroic battle of Rezang La, China suddenly declared an unilateral cease fire and withdrew all soldiers 20 Km behind the positions held by them on November 21st. The attack on Chushsul never came. It was clear that the greatest battle of Rezang La had broken the Chinese momentum. Rezang La was the turning point of 1962 war in Ladakh. Many theories have been propounded about Chinese unilateral withdrawal. Out of these couple of reasons appear logical to me. In the first place, Chinese had perhaps never expected with their earlier experience with CRPF, to loose so many men in the war. Secondly, they were fighting a limited border war to safeguard the safety of Tibet-Xinjiang road, which they considered as the most crucial and vital artery for moving men and materials between Tibet and Xinjiang. 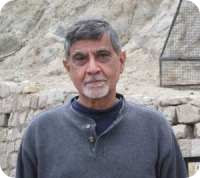 Since their aim was fulfilled and Indians were pushed back to 1959 positions, they saw no point in continuing this war. Whatever may be true reason for this Chinese action, The Battle of Rezang La must have been one of the key factors at arriving this decision. There is no doubt in my mind that Indian soldiers in Ladakh did their duty exceedingly well. They faced a numerically much superior enemy with vastly inferior weapons and inflicted heavy losses. Even if India had lost the 1962 war, there have been substantial gains made by India as a nation. 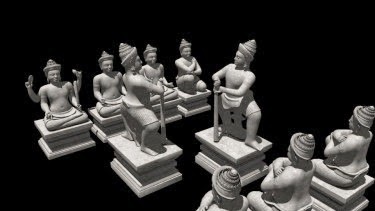 In the first place, India gave up all dreamy notions like Non Alignment and Panchshil. Secondly the Government of India realized the great blunder that it had perpetuated for last 14 years in neglecting the Indian armed forces. In the later years, armed forces were again provided with requisite strength, funds and the forces re gained their importance. I always think that the fight that Major Shaitan Singh and his men gave at Rezang La, would always be remembered by every Indian not only as an epic battle, but as an ultimate proof of what could be achieved by few resolute men, acting against all odds. The death of so many soldiers was certainly on the head of Mr Nehru's stupid idealistic policies and history will surely call him a failed prime minister of India. All these soldiers died not because of valor of the enemy but because of stupid mistakes of their own rulers. It is so sad to think of them. Thanks for your comments on the serial. I think it was a heavy price paid by these brave soldiers, so that Neheru and his clowns woke up from their dreams and started paying attention to military, defense. I heard a rumor back then that the defense minister Krishna Menon had ordered the ordanance factories to make coffee making machines, instead of weapons! He got kicked out and Yashawantraw Chavan became the new defense minister. Lucky him, that chinese stopped the war. Thanks for all your comments on the serial. I read that article. t is very touching. Here is the link if any one else wants to read it. An excellent write up on the 1962 War. The 'C' Company of 13 Kumaon are/were composed of Ahirs, a majority, (I think 104 of the 124 men who fought this battle) of whom hailed from Mahendragarh in Haryana. It is this Company which engaged the Chinese on 18th November 1962. It is said that they refused the order of evacuation and fought the enemy against all odds. As correctly pointed out by you the dead bodies of the brave soldiers were recovered much later in summer months, with almost everyone still clutching his weapon and in his trench. The 3 in Mortar detachment crew still held bombs in their hands, with their bodies pierced by bullets and shrapnel. The Nursing Assistant’s body was found with him holding a bandage and syringe in either hand. This battle as well as the Battle of Saragarhi fought by the brave Sikhs rank with the Battle of Thermopylae amongst the most famous battles. Unfortunately it does not merit mention even in our history text books and successive governments have never bothered to honour the martyrs of Rezang La. Just a tidbit - I was born on that day (18th Nov), of course not in 1962, but few years later. And I tell my well wishers, family and friends to remember the brave-hearts of the Kumaon Regiment rather than wishing me. And also I happened to visit the Kumaon Regimental Centre in Ranikhet a few years back and with luck interacted with the men of 13 Kumaon. It was quite an emotional moment in my life.